Why bother estimating pressure drop in air lines? While estimating pressure drop in lengths of air line is not too complex if the end application for the compressed air is not a critical one, and more complex if the end pressure and flow are critical, knowing what will come out of the air line at the air tool or air-use application can be important. Having said that, if the air-using application demands an exact and certain flow and pressure, then I think you would be wise to get the industrial air professionals involved. If close will suit then this following information will be useful. One way of determining pressure drop is to use a differential pressure meter. For the following orifice flow chart, I researched numbers from quite a few sources, and the figures shown are an average of those. I can understand folks being puzzled about estimating pressure drop, as I was initially as I did my research. One of the sources says that the air is measured in SCFM, another one says that it is CFM, and still another uses ACFM. So, even the experts, among whom I do not count myself, are not able to provide consistent information. As a guide to help you determine pressure drop, first check the air flow through the orifice that is the same size (or close) to the I.D. of your selected air line. The purpose is to ensure that the expected air flow rating will be more than enough to run your application(s). The chart assumes that the air supply is 90 / 100 PSI, the air temperature is 70 deg. 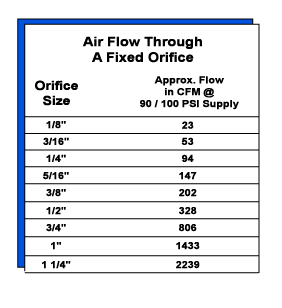 F., and there is virtually no pressure drop in the line as the orifice opens immediately to atmosphere from the compressed air supply. Once you’ve selected what you think will be the ideal supply line I.D., one that will provide the flow capacity that your air tools or air circuit will require over the distance the line must travel, you then must consider estimating the pressure drop in your air system, to make sure you have allowed enough extra flow capacity for the line losses you will experience. The characteristics or the condition of your air lines will affect any flow figures. For example, aged black pipe used for air lines may contain an abundance of rust imparting a very rough surface to the inner diameter of the pipe. This will significantly increase the pressure drop, not to mention allowing chunks of rust to travel along with your compressed air, from time to time. If there is considerable moisture in the mains, this too will increase pressure drop. The flowing compressed air has to overcome increased friction between it, the water, and the inner surface of the air pipe. Don’t forget your compressed air fittings! Every elbow, every Tee and even every coupling cause turbulence in the air as it passes, and this increases the pressure loss. The loss through fittings is calculated by estimating how much longer the air line would be to correspond to the type and size of fitting. Each size, and each type of fitting, has a different pressure drop flow factor. Further, any compressed air supply valves, depending on their type, and size, and shape, can significantly influence pressure drop in the compressed air. To make it simple, and to err on the side of caution, if I were estimating pressure drop for the fittings in my supply air line, I would factor in 5′ (five feet) of extra air line for every fitting, to allow for fitting caused pressure drop. If I had 20 fittings from my compressor to my application, that would be the equivalent of an additional 100′ of air line added to the total air line length I would use to figure my pressure drop over that distance. In the larger fitting sizes, the pressure drop caused by the air fitting is less, but for simplicity’s sake, I would still use the factor of 5 feet of air line length for every fitting in the air circuit. There are a few commonly accepted rules about pressure drop. One is, the higher the flow rate at a constant pressure, the greater the pressure loss per length of pipe. The second, the lower the inlet pressure with a constant flow, the greater the pressure loss per length of pipe. And last – regardless of the flow or the pressure, the smoother the I.D. of the pipe, the lower the loss over a given length of pipe. What is the actual pressure drop? Do the math for your particular system, or use one of the commercially available software packages written for that purpose or use a device like a differential pressure meter. These are available commercially if you Google “differential pressure meter”. When it comes to counting my pay check, my math skills are as good as anyone’s. However, when it comes to formulas, when it comes to understanding the symbols and sequences for applying numbers in a formula, then I admit to being somewhat of a “mathophobic”! If you would prefer to do the compressed air pressure-drop math yourself, then Google “pressure drop calculations” to find sources of the formulae. www.kaeser.com/Online_Services/Toolbox/Pressure_drop/default.asp offers an on line chart into which you can put the parameters of your air lines, and it will calculate pressure drop for you. Need more info on pressure drop? If the guidelines and info here don’t suffice, and knowing the pressure drop for your system is critical for your operation, enlist an engineer or a professional fluid power expert to help. Good luck!